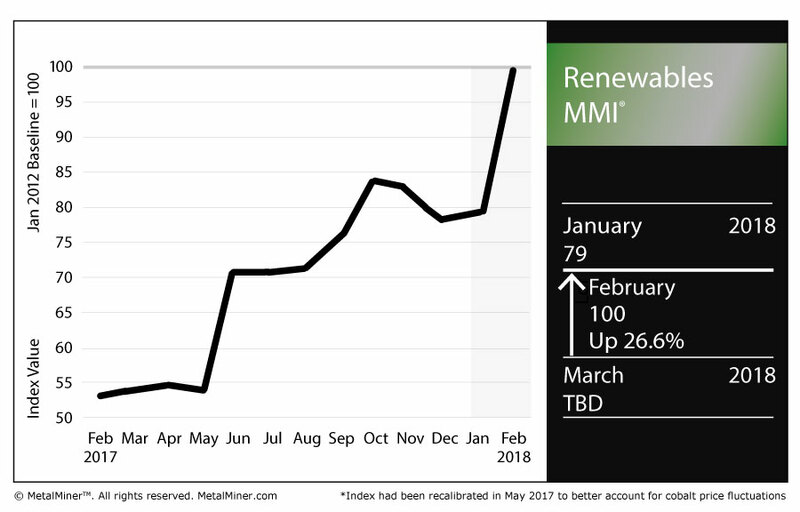 The Renewables MMI (Monthly Metals Index) skyrocketed this month, gaining 21 points en route to a 100 February reading. The basket of metals posted price increases across the board, particularly in the steel plate category. Japanese steel plate jumped 2.8%, while Korean steel plate rose 2.4%. Chinese plate jumped slightly, by 0.3%, and U.S. plate was up 6.5% as of Feb. 1. 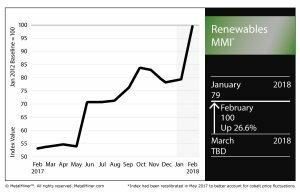 Prices of neodymium, silicon and cobalt from China all posted significant price increases over the past month. Scarcity of Critical Minerals to Threaten Renewable Industry? According to a report from Stanford University, a scarcity in rare minerals could undercut the move toward greener forms of energy. The topic was put forth for discussion at a mineral resources conference hosted by the university last month. “Due to the rapidly increasing need for mineral resources as Earth’s human population continues to grow exponentially and the need to minimize the environmental and social impacts of mining, it’s essential that Stanford be involved in the field of economic geology — the study of the formation, exploration, and utilization of mineral resources,” said Gordon Brown, a professor of geological sciences at Stanford’s School of Earth, Energy & Environmental Sciences, as quoted in the report. Uranium, copper, gold, lithium and rare earth elements (REEs) were among the materials cited in the report as critical to the future of renewable energy. Among the trends impacting the supply of these valuable materials, according to the report, included: humanity’s increasingly growing rate of metal consumption, the concentration of rare elements in a relatively few countries, the quality (or lack thereof) of U.S. mineral mapping and reduction of mineral waste. Speaking of the concentration of minerals, the Democratic Republic of Congo is home to more than half of annual global cobalt production each year (in 2016, 66,000 of the 123,000 tons produced worldwide were sourced in the DRC, according to the U.S. Geological Survey). Prices of cobalt are on the rise, shooting up a whopping 44.8% month over month. With a number of international mining firms doing business in the DRC, the country’s largest state-owned mining company, Gecamines, is seeking to assert greater control of the market, Bloomberg reported. 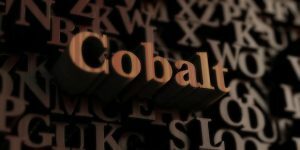 “I find it scandalous that when cobalt is discussed, and the explosion of electric vehicles, only the traders and consumers are referenced and Congo and Gecamines are not cited,” Gecamines Chairman Albert Yuma was quoted as saying. As reported by Reuters, Gecamines wants to renegotiate its contracts with foreign firms in order to work toward asserting further control of that cobalt market. Cobalt is valuable for, among other uses, its application in electric vehicle batteries.